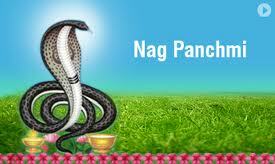 In Punjab Nag-Panchami is known by the name of "Guga-Navami". A huge snake is shaped from dough, which is kneaded from the contribution of flour and butter from every household. The dough-snake is then placed on a winnowing basket and taken round the village in a colourful procession in which women and children sing and dance and onlookers shower flowers. When the procession reaches the main square of the village all thereligious rites are performed to invoke the blessings of the snake god and then the dough snake is ceremoniously buried.